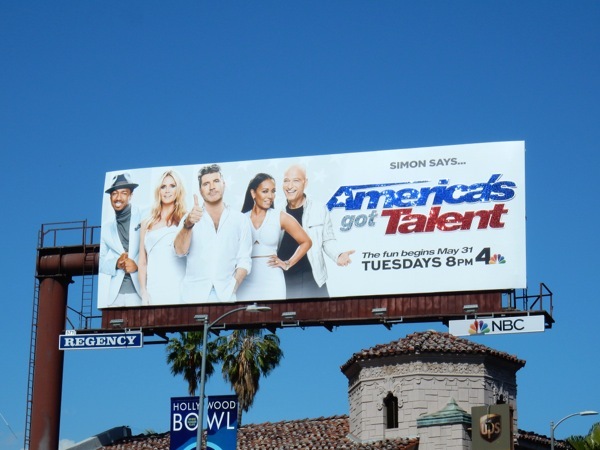 For the eleventh season of America's Got Talent, Simon Cowell joins the judges on the show that he helped create following the success of the Pop/American Idol and The X Factor reality talent show franchises. No stranger to the idea of finding the next singing, dancing or performing sensation, he's judged all ten seasons of Britain's Got Talent, discovered a whole slew of talent on U.K.'s The X Factor and of course is well known stateside for his no-nonsense comments and withering looks on American Idol. 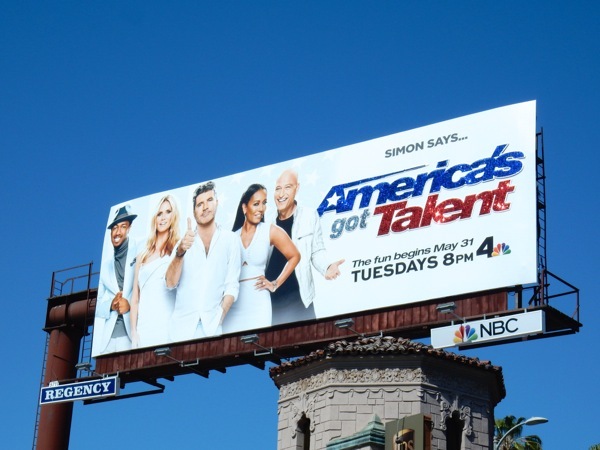 Now he joins Nick Cannon, Heidi Klum, Mel B and Howie Mandel to shake things up on AGT. But remember, just because you dress Simon Cowell in white, that doesn't make him any more angelic. 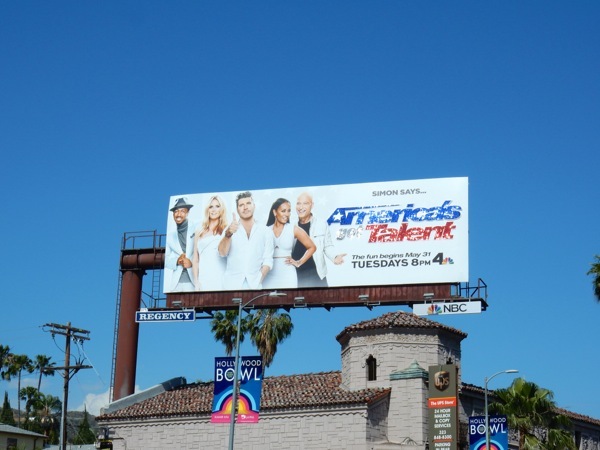 Not only should his addition to the judging panel help turn heads, but NBC have also added a little sparkle to draw some attention to this latest season's billboard. The standard landscape billboard was spied along La Cienega Boulevard at 3rd Street on April 28, whilst the glittering logo version was photographed along West Hollywood's Sunset Boulevard on May 1, 2016. Here's also a video of the patriotic red, white (silver) and blue logo shimmering in all its glory, dazzling passersby on Sunset Boulevard. 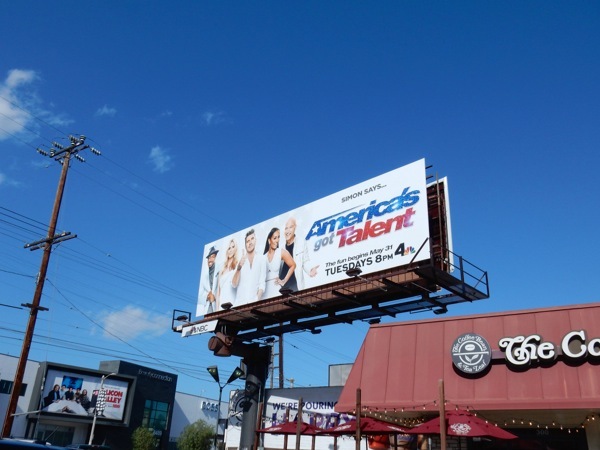 If you're a fan of the show, be sure to also check out all these other season billboards for America's Got Talent which featured previous judges Sharon Osbourne and Howard Stern. 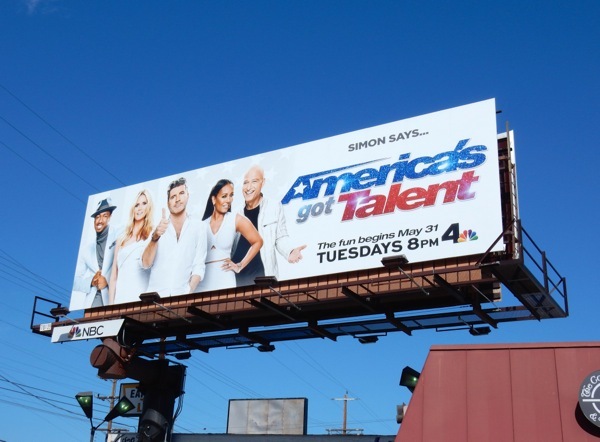 Plus you can also see Simon Cowell in these billboards for the U.S. version of The X Factor (which only lasted three seasons). Meanwhile if you like this glittering gimmick, make sure you also take a look at this glittering lips billboard for 2013's American Music Awards, these Disneyland Diamond Celebration billboards from last year and these GCB series launch billboards from 2012. All that glitters is not gold, sometimes it's a spectacular billboard design trying to catch your eye.